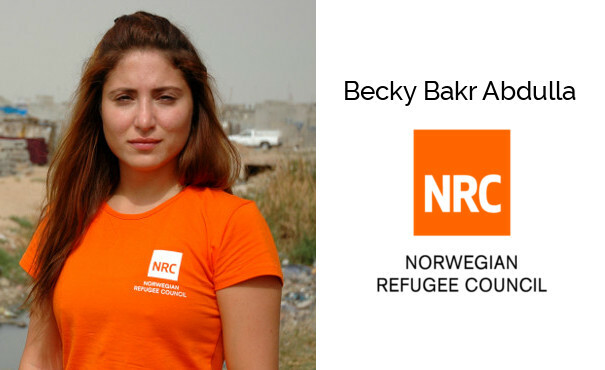 Meet Becky Bakr Abdulla, Media Coordinator in Iraq for the Norwegian Refugee Council (NRC). Listening to this podcast episode will really give you an understanding of the importance of communications and what it means to be working in a conflict situation for an international organization such as the NRC. Becky Bakr Abdulla, a 27-year old from Oslo, Norway, is in the beginning of her career with the Norwegian Refugee Council, the NRC. In a short while she has gone from graduating university, via an internship, to being sent right into a field role as a Media Coordinator, where she’s dealing directly with the humanitarian crisis in Iraq. Becky is also a child of refugee parents from Kurdistan, which is located in the northern part of Iraq, where she is currently based. – Obviously that sort of background has always given me an interest in more than just in a region border. I’ve always had an interest in travelling, in learning more about other cultures and other nationalities. So when it was time for me to study and decide on something to study, I started off in Rome, in Italy, and I did some courses there in philosophy. And then, I did some courses in sociology before I decided that media communication sounded very interesting. So that’s my background. It’s within media and communication, and it’s given me a nice platform for the work I’m doing now with NRC, where I’m the Media Coordinator. And I’m also based abroad. So I find myself in a very satisfying position, Becky says. Becky is stationed in Erbil, the capital city of the Kurdistan region in the northern part of Iraq where the majority of the population are Kurds. With 3.4 million people currently displaced inside their own country and, in addition, the Kurdistan region of Iraq have taken in approximately 250,000 Syrians. This means that Iraq is in an ongoing crisis currently now, escalating into becoming a humanitarian crisis on a very big level. – We see that there’s a lot of attention on Syria, rightly so, but Iraq is definitely forgotten when it comes to the human stories, the human testimonies, the human suffering that we so desperately need more to focus on. And that’s also been extremely rewarding and something I’m very proud of myself and my team down here is that we’ve now managed with Fallujah to show the rest of the world through BBC, through Al Jazeera, through CNN, through New York Times, through dozens of different media outlets, that these are the people of Iraq, these are the civilian and innocent women, children, elderly that are taking the biggest fall for what’s going on here. And that’s been extremely rewarding, Becky says. With her job also comes a lot of traveling. So for the last month, she has been based in Baghdad, covering the Fallujah crisis and response. But she also travel to other parts of the country, to a city called Kirkuk and also to Dohuk, which is a city in the northern part of Kurdistan where most of the Syrian refugees are currently located. According to Becky the Iraq crisis is a forgotten crisis in the sense that Iraq is all over the news almost on a daily basis, but the focus tends to be with the military and the political narrative. – My biggest challenge up until now, the last month with Fallujah, has been to get Iraq on the map. So the human side to what’s going on here is often forgotten. People are very interested in reading about the politics around it, international states’ involvement in Iraq, the different warring parties in the conflict. But we’re not hearing too much about the civilian population who, for decades, have been trapped in crossfire and in a very insecure situation. So up until Fallujah, I think my main challenge through my work was to try to get media attention. I have tried to send out several press releases without really getting a lot of attention at all. – Although the days can be very, very long, media works in a way that, if you get a momentum, you want to try to stay on top of it. And we have for nearly a month now, we’re still able to send in stories about the civilians here, which means extremely long working hours, high intensity, you’re in cars for hours to try to reach… You’re out in the scorching heat interviewing people. Of course, you hear about a lot of human suffering that, at times, can be mentally distressing for me as well. But, when you then have BBC calling you up and they want to hear what is it that these people told you today, it’s just that more rewarding and you really get motivated to just continue doing the work you’re doing. And, at the end of the day, it is about the internally displaced people and the refugees, which is why NRC is present in Iraq along with other humanitarian actors. Communication work is an area where many international organizations are recruiting, but it might also be an area where lots of people who are wanted or have their ambitions to work with more mission driven organizations, that’s probably not the area that they think about the first. Becky Bakr Abdulla studied media and communication and now work as a Media Coordinator, but how did her career start? How did she end up with working for NRC? – As a media advisor, obviously you have different directions you can take. The communication part of my education is quite wide. I mean every single workplace needs to have good communication, whether that’s internal communication, meaning the communication that is between the staff members and the colleagues in a workplace, or if it’s external communication, meaning if you are part of a firm or organization or a governmental organ that needs to communicate externally to the public or to other stakeholders. So the communication part of my position opened up a lot of doors for me, and I could basically decide whether I wanted to work in the private sector or in the public sector. And then, the media part of my work is obviously more related to the external communication. I knew that I wanted to work for a private organization, an independent organization with an ideal goal. Why working for an organization such as NRC? – I’ve always known that I want to sort of work for the greater good or somehow through my line of education help other people. And, as part of my last semester at university we were given the opportunity to become interns. And the Norwegian Refugee Council, with their head office in Oslo, had taken in students from my university in years before me, and after a bit of back and forth and evaluating what sort of humanitarian aid organization I wanted to work for, the choice fell on NRC. They’re very well recognized for their in-field sort of expertise, which I found extremely interesting to have a job where I’m actually on the ground, in close communication with the people we’re meant to assist. But also, obviously, my own personal background, being the child of migrant refugees that managed to escape their country and make a new life and a new beginning, providing loads of opportunities and hope for their own children, the Norwegian Refugee Council felt like a very natural option for me, Becky says. – I did an internship at NRC for 3 months. And through that internship, I was really very dedicated and devoted. So I would work late hours, I would really show that this is something that is more than just an internship for me. And that was recognized by my mentors and my colleagues at the time, by giving me more opportunities and more responsibility, and more tasks basically. And I would say yes to everything that was thrown my way, and was very excited to do so, which then again provided me a summer job for 2 months. And, from that, the ball sort of just rolled out and I was given an internship in Iraq for 4 months, before then going back to head office, working as a Media Coordinator, and now I’m based in Iraq, which is NRC’s biggest country operation. So yeah, it’s been quite a big opportunity for me to get a foot in with NRC, to manage to show that I’m dedicated and devoted, and to be identified as a hard-working colleague as well, which they’ve been willing to build upon. Yes, it’s been great, Becky says. Because NRC is such a huge organization and because they are an independent organization, they are also extremely reliant on support from stakeholders such as donors, but also the public. Part of Becky’s mandate as a Media Coordinator is to create awareness about NRC’s work but also to advocate for change, meaning when there is a crisis going on, like the retaking of Fallujah city where approximately 50,000 individuals were trapped for around a month’s time her job is to get these people’s stories out. – We want to get the Iraqi civil societies, civilians’ stories out. We want to put it on the agenda. We want the rest of the world to know what is going on, what type of suffering these people are going through. Now that’s because of two reasons. One is the information itself: People back home – friends, family, neighbors, you name it, politicians – need to know the condition for innocent people, that information we need to have. We need to know the consequences of the actions when a war is started. The second one is to try to advocate for a change. Now, what does that mean? In this case in Fallujah, it meant trying to secure these 50,000 individuals that were trapped in their own city safe roads out. We want to get them out in safety without then having to jeopardize their own lives and the lives of their children. We also want to mobilize more support through funding, basically through more money for the work that we are doing, which is providing them with life-saving assistance. And media is only one way of doing advocacy. And it’s the most public and external way of doing advocacy work, Becky says. – Through our last campaign, which was to try to get Fallujah on the map, we really have managed to raise awareness around all the civilian loss and innocent people’s lives and what has been going on with them in the middle of a very heavy crossfire. And we’ve also managed to mobilize more funding and donor interests in support in order to give them the help that they need because Iraq, as well as many, many other crises around the world are massively underfunded. There are people back home, in my own home country of Norway, who don’t really see the reason why we should help anyone else than ourselves. They think that Norway is a rich country. As long as me and my family and my friends and my neighbors have what we need, then why should our tax money go for people far away, in a distant country, I don’t even see them, I don’t even know what’s going on with them. My job is to try to enlighten these people and give them the information they need in order to stop for a second and think wait, these are our fellow human beings, these are innocent people, they need our help. It could just as easily have been me or you. So I guess through the work I do, my main objective is to try to change public opinion as well as the rest of the international community, politicians and the donor society. Now you know the overall objective of Becky’s role and how important it is to create awareness and to be an advocate for the people who are suffering in the region, but what does a typical work week look like for Becky? – A week for me can be anything from coordinating with journalists, since a lot of them want to write about the crisis and the human suffering, and of course that’s something we support because they also provide a channel for these people’s voices to be heard. So, I can coordinate field visits with journalists, helping them get access to places they might not get access to themselves, introducing them with families down here that are displaced and that I know well and that want their voices to be heard, that are open to talking to external media. – Another part of the job is me working as a journalist. I’m mainly based out in field, meaning that my job is not an office job, I’m out in the camps and in the areas where the displaced populations have sought refuge. I’m there talking to them, I’m writing down their stories, I’m filming them, I’m taking their photos, and I’m producing multimedia material myself in order to get the story out. Another side of it is like we now saw with Fallujah, that I almost worked as a correspondent where external media contact me and they want interviews from on the ground. We provide them with the latest updated numbers and figures. But also, with quotes and strong testimonies from the people that are displaced and that are suffering, in order to raise awareness around their situation. So, it’s definitely a coordination position which includes a lot of different and highly challenging and fun tasks. Working as an aid worker in a conflict-affected country is a decision you have to be very aware of before you enter it. Many wouldn’t want to or wouldn’t like that type of work due to the human suffering and concerns about security. So how does Becky Bakr Abdulla handle that? – As a person who starts off my career with NRC at their beautiful head office in Oslo, in safe Norway, the distance is quite big to the life I’m now living in Iraq. So that’s a decision you sort of have to take and you really have to think through it. I was in close dialogue with my parents, with my closest friends back home, and also with my colleagues before I made the decision to get out here, to be stationed out in field. And, in many ways, that’s a personal decision to take as well. I knew with myself that I’m in a place in my career, but also personally, where I have a lot of extra energy. I’m able to give that extra percentage. I have the right support network around me, both from my organization when it comes to security and mental health, but also friends and parents that I’m in touch with on a weekly basis, that I can vent to, that I can cry to, that I can laugh to, that sort of give me that sense of normality even though my job out here in no way resembles my office job in Oslo, in Norway. – What’s also extremely important is that you take that responsibility yourself of ensuring your own well-being whilst you work in a conflict-affected country. Now I do that though different choices and decisions. It can be as easy as a decision of what you’re going to put in your mouth when you’re hungry, trying to keep a healthy diet, trying to move, trying to have a gym membership or do boxing, whatever it is that makes you get a mental release and sweat it out a bit. But also surround yourself with good people. I mean the individuals down here really make the difference. My colleagues down here, my mentors, and that are in the same position as me and that can guide me and motivate me equally as I guide and motivate them as best as I can. – Security wise, NRC provides a spectacular heat training, which trains you up in how to deal with different possible scenarios that you can meet with when you’re in a hostile environment. That’s a week long, very intense training. I’ve done several trainings online that the UN provide, that basically just gets you ready for the different types of scenarios and threats that you can meet. Now of course we also have security advisors and other security networks in country, at our regional office, at our head office, where we get a lot of in-depth assessments and analysis, and where they provide us with rules and also guidance and advice on what to do and what not to do. I mean staff security comes before everything. We can’t help anyone if we’re putting ourselves at risk. So that always comes first. So, in that sense, I feel quite safe, while at the same time, I always am alerted, I’m always mitigating the risks, I’m always trying to keep a low profile. Many job seekers who are interested in joining an international organization such as NRC, knows that it is not easy to get a foot into the door and that you have to compete with highly professional people with decades of experience and strong educational background. UNjobfinder asked Becky Bakr Abdulla to share some advice and tips how to to succeed. – Have your goals straight, aim for where you want to go, work hard for it. And, with that, I mean 12-13 hour days, even more. Work hard for it, but also be humble in the sense of listening to others, taking their advice and truly finding one or two mentors that you can look up to and that can motivate you, I guess would be my advice so far, not even three years into my career, Becky says. – I used to work in the same office as our Secretary General, Jan Egeland, which for many people is a legend. So you can quickly feel a bit disheartened as a junior, and I am still a junior, I’m entering now my third year with the Norwegian Refugee Council. Before that, I was still a student. You can quickly feel oh wow, how will I ever be able to measure up with my colleagues? There are so many great individuals within NRC that are extremely capable and resourceful. I think my biggest advice would be don’t be intimidated. On the contrary, try to get close to these people and use them as your mentors. Through my initial internship, I was given sort of a mentor person that was meant to guide me. So that choice was sort of made easy. But then, of course, also through the line of your work, through your day-to-day office work, you will find certain colleagues that you identify more with and that you sort of really start to look up to and admire for their work. – It’s always better to ask one question too many than sitting there on your own for 30 minutes trying to find out something that you might not have the answer to on your own. And I was lucky through my initial months at NRC head office as an intern, I had a lot of very patient people around me that would answer my 46th question of the day although they were themselves occupied with very busy schedules. Provided that you’re in a fruitful environment where there’s a lot of positive work space, you will be able to find those relationships where you can reach out, asking a zillion questions, Becky says. – I still always carry a notebook wherever I am. If I’m out in field collecting human stories, of course I need a notebook. Or if someone calls me into their office, I always carry a notebook. I note down everything they tell me, Becky says. Norwegian Refugee Council (NRC) is recognized as one the world’s most credible humanitarian, non-governmental organisation. NRC promotes and protects the rights of refugees and people who have been displaced within their own country. The organization has a very strong operation side, which means that the aid they are actually delivering is going through their different programmes: on education, shelter, ICLA (information, legal assistance and counseling), or WASH-programmes (water, hygiene and sanitation). NRC has a also a very strong local presence in over 25 countries worldwide and have over 9,000 staff members working to provide people in displacement with these different services. Find more information about NRC here. Want to listen to more Podcast episodes? To ensure that you will get all new episodes, we advise you to subscribe on iTunes, SoundCloud or Stitcher. Showing what you think about this show by leaving an honest review on iTunes is something we really appreciate. At unjobfinder.org/podcast, you can always find show notes of the episodes and the full transcript. Becky, thank you again for being such a great guest! Was this podcast relevant for you?